Over the weekend, Jeff and I went out of town for a night to a friend's birthday party at a lake house. Subsequently, Milton spent the night at Downtown Dog, his daycare. The next day when we picked him up at 9:00A.M., he was zonked out! It was much too much effort for the Milt to keep his eyes open all day long. He literally slept from 10A.M. - 6P.M. Jeff and I thought we partied pretty hard the night prior, but obviously Milton went all out all night long! On that day we returned, Jeff worked outside on his fence, and like always he wanted his Milt to join him. Jeff sometimes likes to consult with Milt about fencing particulars...! Of course, due to Milt's crazy night, he had no interest in going outside to help his dear old dad, but rather he preferred to snuggle up on his bed. Jeff dragged him out there though, and since the gate was open, Milton was tethered to a lead to keep him secure. 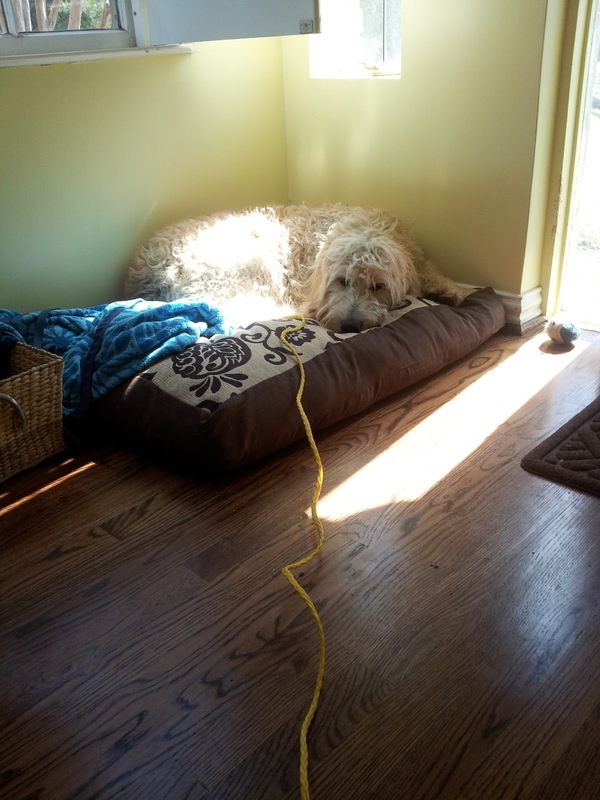 However, whenever Jeff needs Milt's help, he unties him and lets him wander loose. 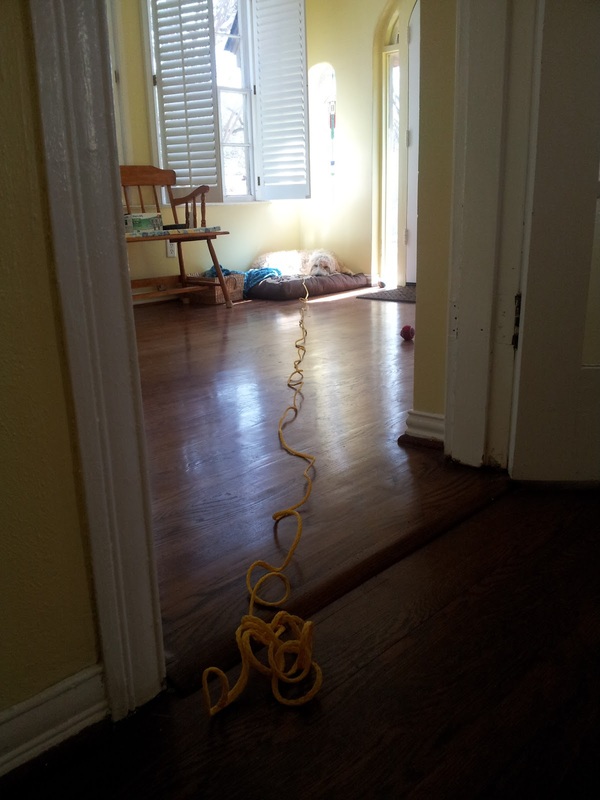 Well, after a long while, Jeff came inside to check on my painting job, and Milton bypassed us to walk very slowly and purposely, with yellow rope dragging, all the way back to his bed in the foyer. The greatest part about Milt's lack of energy was it enabled us to get an awful lot of work done around the house. The sad part is we really miss him when he's not working side by side with us. Well, perhaps it is best to just let sleeping dogs lie! Hysterical!!! Poor fella was zonked out.